In early 2015, President Obama announced a $215 million investment in the 2016 budget to revolutionize health improvement efforts and disease treatment. The Precision Medicine Initiative (PMI) is a new model of patient-powered research using big data to expedite greater understanding of a range of cancers and eventually many understudied and rare conditions (White House, 2015a). The intent is that genetic, environmental, and lifestyle factors that could guide prevention and treatment efforts at the individual level will become more readily identified and available to inform clinical decision making, self-management, and population health. The PMI brings to bear the long-standing promise of predictive analytics to personalize medicine with far greater potential than we have seen to date. A cohort of more than 1 million volunteer participants will be sought to contribute genomic and health data over a yet unspecified period of time. Although many details have not been finalized, the PMI clearly is a new and exciting direction for medical research, and the benefits are unquestionable if executed well. The value of this million-plus cohort ultimately is in its ability to cultivate findings generalizable to the population at large and to offer increased precision in determining individual risks of disease and treatment recommendations. To realize this value the PMI will need to attract a diverse pool of subjects with adequate representation from certain groups that may be disproportionately affected by many of the conditions prioritized for study. In addition, the “data capture” will need to be as comprehensive as possible to predict an individual’s risk with the greatest precision. Both of these agendas would benefit, we believe, from what has been learned from health services research over the past few decades. Specifically, findings from a number of health disparities studies and health literacy studies can greatly inform the PMI in the following four areas: (1) participant recruitment, (2) cohort retention, (3) comprehensive data collection activities, and (4) return of results to participants and the public at large. Given the initiative’s reliance on the fidelity of the volunteer cohort to reach its objectives and mandate, we offer a closer look at these four areas through our collective lens of health literacy and disparities work over the last two decades. Considerable evidence has repeatedly found numerous disparities in subject recruitment to clinical trials and other research investigations. Individuals who are socioeconomically disadvantaged, have lower health literacy, and belong to racial/ethnic minority communities are often less likely to participate in research studies and biorepositories (George et al., 2014). This lower rate of participation may be due to many reasons, including lack of awareness, inadequate understanding of research and its value, distrust of the medical community, perceived burden of participation, and communication barriers. As a result, there is an imbalance in epidemiological investigations and clinical trials relating to these groups of individuals. The charge for the PMI will be to ensure that messages to the public, and especially to the communities where participation is sought, are noted for their clarity. Thus, communications must be understandable, comprehensive, and culturally appropriate; moreover, they should be characterized by transparency in explaining what the PMI is about, how all personal data will be used and protected, and the benefits and risks associated with being part of this study. Given the PMI’s overall aim and the statistical nuances of predictability, probability, and individual risk, the devil will be in the details of ensuring that those volunteering really understand “what’s in it for me.” There are evidence-based health literacy “best practices” to refer to when building the outreach campaign, and these can guide recruitment processes and message content (AHRQ, 2009). The challenge of properly engaging communities does not stop after enrolling and obtaining consent from participants; rather, it extends across the entire time an individual remains a part of the cohort and beyond. Limited health literacy and other individual differences are linked to higher attrition rates for longitudinal studies even more so than for clinical trials (Rabbit et al., 2008). Many of the same reasons cited for disparities in participation rates also apply here. Yet the reasons for drop out may also be due in large part to the greater risk that factors such as lower educational attainment and limited health literacy place on an individual—that being poorer health. While similar efforts to keep individuals in research studies over a number of years may help mitigate attrition rates not due to an individual having been institutionalized or having died, differences may still persist. Yet if these risk factors for individuals are known, it is possible to account for them in analytic models. Thus, we assert that addressing attrition in the PMI means not only taking steps to keep patients engaged and believing in the importance of their participation but also assessing those factors that might predict who in this longitudinal cohort is likely to be retained. treatment for optimal benefit. Health literacy is a strong example of a behavioral risk factor that we believe should be considered for inclusion in the PMI, as more than 600 original investigations to date have demonstrated associations between adult literacy skills and a range of health outcomes, including prevalence of disease, chronic disease outcomes, hospitalization, and mortality risk (Berkman et al., 2011). In prospective studies, health literacy has been found to be a stronger predictor of health outcomes than educational attainment. Individual personality or “patient activation” differences and their role in predicting health outcomes might also help the precision of predictive models. Early PMI documents describe its ambitious data-collection goals. All who choose to enroll will want to understand what this study means to them as individuals and how their personal data, including that “repurposed” from sources such as electronic health records, mobile devices, and sensors, will actually be handled and used. A volunteer’s participation in this study offers significantly more to the larger population than it does to an individual, and our greatest challenge may be to clearly explain that altruism in a way that simultaneously motivates and supports enrollment and longterm participation. In addition, the public’s trust in PMI requires adequate feedback of research findings to participants. Those who volunteer personal health information and time, and especially those already less engaged in health care and experiencing health inequities, must be meaningfully involved throughout the process. Thus, we believe that the PMI requires an accompanying communication strategy that is proactive in establishing privacy and trust principles, allows for input from the broad constituency of stakeholders, and imparts health literacy principles in message design and approaches to dissemination. The PMI working group’s report to the advisory committee to the NIH director calls for a “highly interactive and proactive participation model” for all aspects of the cohort (NIH, 2015). In November, the White House released privacy and trust principles for the PMI, highlighting the need to engage participants as collaborators to garner trust and participation (White House, 2015b). In summary, participant input into the crafting of clear, navigable, and useful messages and processes are hard-learned lessons from the field of health literacy. We have an opportunity to strengthen the public’s trust when we get things right, and the PMI offers a chance for a large, diverse, and more engaged community to contribute to our nation’s medical care and to better understand our public’s health. 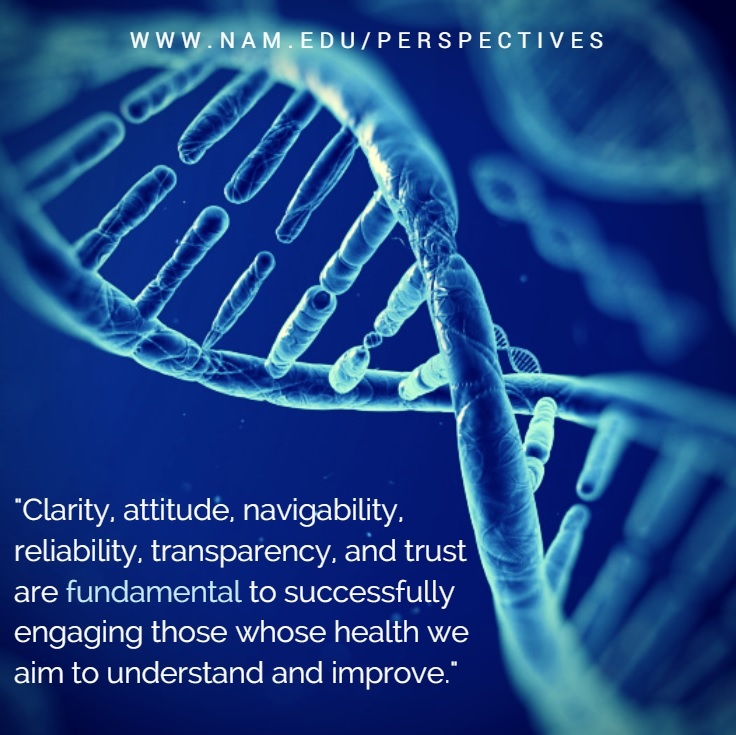 Clarity, attitude, navigability, reliability, transparency, and trust are fundamental to successfully engaging those whose health we aim to understand and improve. AHRQ (Agency for Healthcare Research and Quality). 2009. The AHRQ Informed Consent and Authorization Toolkit for Minimal Risk Research, chapter 2: How to improve informed consent and authorization. http://www.ahrq.gov/funding/policies/informedconsent/ictoolkit2.html (accessed July 28, 2015). Berkman, N. D., S. L. Sheridan, K. E. Donahue, D. J. Halpern, and K. Crotty. 2011. Low health literacy and health outcomes: An updated systematic review. Annals of Internal Medicine 155:97–107. George, S., N. Duran, and K. Norris. 2014. A systematic review of barriers and facilitators to minority research participation among African Americans, Latinos, Asian Americans, and Pacific Islanders. American Journal of Public Health 104:e16–e31. NIH (National Institutes of Health). 2015. The Precision Medicine Initiative cohort program: Building a research foundation for 21st century medicine. http://acd.od.nih.gov/reports/DRAFTPMI-WG-Report-9-11-2015-508.pdf (accessed December 17, 2015). Rabbitt, P., M. Lunn, and D. Wong. 2008. Death, dropout, and longitudinal measurements of cognitive change in old age. Journal of Gerontology: Psychological Sciences 63(5):p271–p278. White House. 2015a. The Precision Medicine Initiative. https://whitehouse.gov/precision-medicine (accessed July 28, 2015). White House. 2015b. Building trust and protecting privacy: Progress on the president’s Precision Medicine Initiative. https://www.whitehouse.gov/blog/2015/11/09/releasing-privacy-and-trust-principlesprecision-medicine-initiative (accessed December 17, 2015). Ruth M. Parker, MD, is professor of medicine, pediatrics, and public health at Emory School of Medicine. Suzanne Bakken, RN, PhD, is alumni professor of nursing and professor of biomedical informatics at Columbia University. Michael S. Wolf, PhD, is professor of medicine and learning sciences at Northwestern University Feinberg School of Medicine.